OFM Contemporary Office Desk Chair  Free Shipping! This office desk chair from OFM features contemporary European styling with a durable polyurethane, exo-skeleton back rest and attractive metal accents. 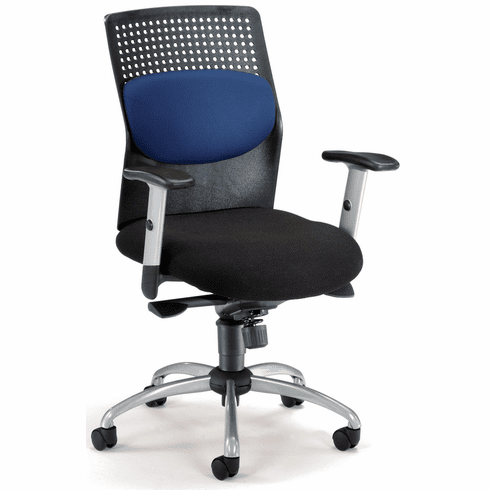 Other features include thickly padded seat cushion with stain-resistant fabric upholstery, adjustable lumbar support, knee-tilt mechanism that allows the user to recline at a more relaxed angle than conventional center tilt, tilt lock with tilt tension adjustment, 360-degree swivel, pneumatic seat height adjustment, height adjustable arms with metal finish, metal finish five star spider base and dual wheel standard casters. This chair meets or exceeds ANSI/BIFMA safety standards. Dimensions: Seat Size: 21"W x 19.5"D. Back Size: 21.25"W x 21.5"H. Seat Height Adjustment: 18- 22"H. Overall: 42"H x 26"W x 27"D. Limited lifetime warranty from OFM. This chair normally ships within 1-2 business days from our NC warehouse.